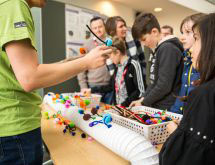 Five Cambridge science institutions including the LMB have won a bid to engage the local region with science as part of European Researchers’ Night, the largest public science event in Europe. LIFE LAB is one of four UK initiatives awarded funding from the European Commission. It will establish a programme of pop-up science events in shopping centres, cafes and music venues across Cambridgeshire on 28th September 2018 and again on 27th September 2019. LIFE LAB will be led by Wellcome Genome Campus Public Engagement, and delivered by a consortium including the Wellcome Sanger Institute, the European Bioinformatics Institute (EMBL-EBI), Babraham Institute, the University of Cambridge and the LMB. A main aim of LIFE LAB is to reach and engage communities who may not otherwise have access to science or research, through a range of hands on activities designed to be inspirational while highlighting the career opportunities across our region. This is the first time that Cambridge has hosted European Researchers’ Night, which will simultaneously involve 55 other projects in 27 countries across the European Union, from Aberdeen to Athens and Helsinki to Heidelberg. 2018 is also the European Year of Cultural Heritage, and the LIFE LAB initiative will celebrate this by showcasing science in culture across our region – past, present and future. Other events around the UK will be organised by the Natural History Museum in London, the University of Aberdeen, and the University of Bristol.